The woodpecker showed up just about the time that Cullen Witter’s little brother disappeared. The small Arkansas town sees the return of the long-thought-extinct woodpecker as the gift of salvation, hoping the excitement of the bird’s sighting will draw people in and revitalize the local economy. Cullen is sick of the bird already, and wishes everyone would stop being so awkward around him since his brother’s disappearance. He also wishes his mom would stop crying and listening to his brother’s old music and reading his books. This summer, Cullen negotiates relationships with others, tries his best to take care of his grieving family, and searches for meaning in it all. First of all, I love books that take teenagers seriously: the ones that validate young people by including them in the exploration of beliefs and the full spectrum of emotions and experiences. Grief? Of course. Love? Absolutely. Fear of the unknown? Everyone is afraid, I promise. It is just that nobody talks about it openly, except in books like these, which is why they are so great! To me, not only do these books say that young people are fully able to participate in the human search for meaning, but they actually offer the vocabulary for expressing such ideas-tools to be used in real life. 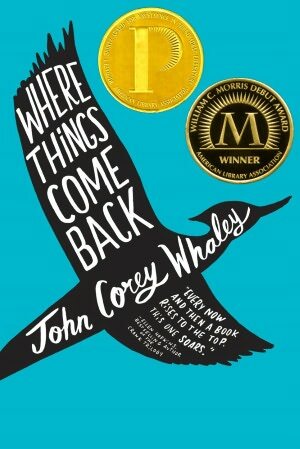 Where Things Come Back is one of those books. You’ll love it because Cullen is a great narrator: his elaborate daydreams include zombies, soundtracks, and miracles. You’ll love being able to read all his thoughts, especially because he is such a complex character-portrayals of characters like this do a lot for breaking down stereotypes about young men and women. And I think you’ll also love it because it makes you think about important things. Whaley, John Corey. Where Things Come Back. Athenum: New York, 2011. 228 p. Age 15 and up. If you liked this book, I think you’d really like Looking for Alaska, which has the same setting, tone, and some similar plot elements. If you liked the summer setting and the elements of religion, Pete Hautman’s Godless might be perfect for you! If the mystery and small town setting was what grabbed you, try Shine by Lauren Myracle. If you want a book about missing loved ones, check out Please Ignore Vera Dietz. And one more! Remember when I talked about using book covers to help you pick books that were alike? Check out John Green’s The Fault in Our Stars. It’s another meaning-book, with a lot of the same Big Questions. But careful with that one-it’s heart-wrenching! Posted on March 1, 2013 May 8, 2013 by ShannaPosted in Ages 15 and up, ALA/YALSA Best Fiction for Young Adults, Michael L. Printz, Mystery, Realistic Fiction, William C. Morris Debut Award, YA LitTagged bird-watching, grief, missing children, missing siblings, religion, small towns.